Homeopathic remedies will treat a person with eye styles or chalazions effectively, without the use of antibiotics. 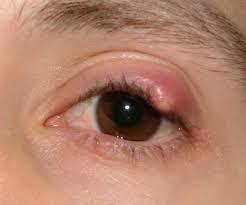 An eye stye may develop when an oil gland at the edge of an eyelid becomes infected. The lump can grow on the inside or outside of the lid. The stye is very often caused by bacteria, most commonly Staphylococcus bacteria. The conjunctiva is red, swollen and infected. There is pus discharge and a burning sensation. Warm compresses improve the pain. The lids may be crusty and eye­lashes could fall out. Person is panicky and not easily reassured. The inner canthi of the eye are red and swollen. The person will be more worried than panicky. Better for closing the eyes and pressing them. Used for a pinkish swelling of the eyelid with stinging and burning pain. Swelling and pain are relieved by cold compresses. 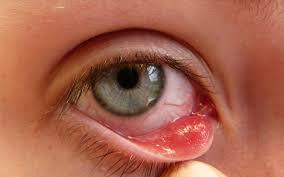 Used for sudden onset of a a tender red lump on the eyelid with throbbing pain, the eye is sensitive to light. Especially useful if the person has had a chalazion for a very long time and has hardened. Chalazion with characteristic features of the swellings in such patients are stony hardness and indurations. Frequently used for styes and chalazion which have a tendency to become stony hard over a period of time. Indicated in those cases of chalazion where the complaints have been chronic and long-standing. Tendency to develop induration of tissues and new growths. Used for ingrown eyelashes, blephritis (inflammation of the eyelids) and eczema which are all common causes of styes. Used for those prone to styes. Use for an extremely painful sty in a child prone to acute suppurations. The eyelids stuck together with purulent discharge; the child is irritable and touchy. A warm compress speeds the rupture and relieves the pain. Used for inflamed eyelids, stuck together with yellowish discharge. Symptoms are alleviated by cold compresses. Stye is painless or with mild pain. Stye is usually on the upper eyelid. Person is usually shy and timid. The child may be prone to recurrent styes. Mercurius is one of the commonly indicated remedy for styes, chalazion, conjunctivitis, acute as well as chronic, recurrent tonsillitis, pharyngitis, colds, fevers. Used for skin complaints with abscesses. t's also a very good drug for nervous affections like tremors, paretic and paralytic conditions, etc. Used for preventing recurrent styes. Especially for a child prone to lingering suppurations, ear styes, ear, nose and throat infections and bladder infections. This is the main homeopathic remedy for chalazion - which is lump in the eyelid that is not painful. Fits best those people who tend to suppress their emotions. The remedy for recurrent styes. Used for styes which are swollen and red, causing burning and itching. The lids in this instance would be more oily than dry. Used as a deep acting remedy which has a wide sphere of action. It positively influences multiple systems of the body such as respiratory system, gastrointestinal system, nervous system, reproductive system, skin, eyes, mind, glands, larynx, etc. Dosing: Give 3 tablets of each three times a day in alteration.